The first book in the #1 New York Times- and USA Today-Bestselling Lunar Chronicles series by Marissa Meyer! See where the futuristic YA fairytale saga all began, with the tale of a teenage cyborg who must fight for Earth's survival against villains from outer space. Humans and androids crowd the raucous streets of New Beijing. A deadly plague ravages the population. From space, a ruthless lunar people watch, waiting to make their move. 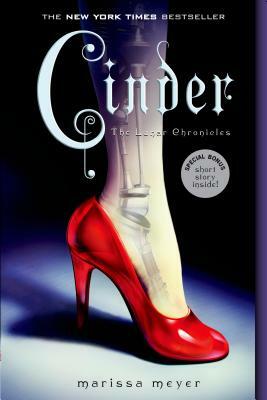 No one knows that Earth's fate hinges on one girl. . . .
Cinder, a gifted mechanic, is a cyborg. She's a second-class citizen with a mysterious past, reviled by her stepmother and blamed for her stepsister's illness. But when her life becomes intertwined with the handsome Prince Kai's, she suddenly finds herself at the center of an intergalactic struggle, and a forbidden attraction. Caught between duty and freedom, loyalty and betrayal, she must uncover secrets about her past in order to protect her world's future. With high-stakes action and a smart, resourceful heroine, Cinder is a Cinderella retelling that is at once classic and strikingly original.